Thought a few of you might dig this project. My son wacked a deer on his last trip home. Did like $6500 damage to his 06 Equinox. We are of the impression, had he had more light, he could have seen them sooner. and sometimes in Montana, late at night, you might drive for 2-3 hours without even seeing another car. 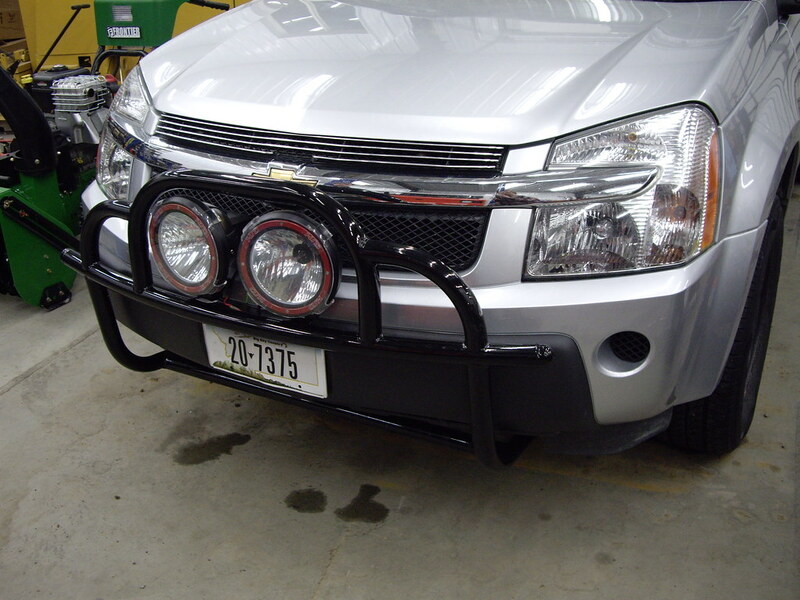 SOOOooooo, he sourced up some decent 7" HID's and we made a brush guard for the Equinox to hold the lights. It's at paint now, we should be getting it back tomorrow. Something you don't see is an Equinox with some pimped out light bar. Not designed as a bumper, just a way to hold the lights and a hoop over them so they don't get broken off accidentally in a parking lot. Mostly made out of 1.25 schedule 40. Last edited by vectorsolid; 02-01-2010, 07:44 PM. LOOKS great!! i want to build one for my truck. the brush guard looks great. how did you form the caps for the ends of the tube? Mind showing some pictures of the bender you used? 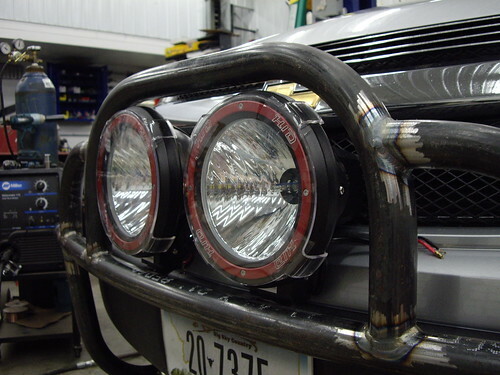 i'd like to use SS tubing for a light bar for my truck. tac it together then have someone who can TIG real well sew it up for me and leave it as-is. Practice and you can TIG it yourself. At least for me stainless is the easiest of the metals to weld. It's not that hard to get the hang of welding stainless, just keep practicing and you'll get it. You can buy them. Anyplace that has weld on pipe fittings should have them. Looks great! You did a great job on the project. I have but one question. Those are rather large lights and placed in front of the grille. I'm wondering is that going to adversely affect the cooling during the hot summer months? The vehicle appears in the photo to have a rather small grille area. Will you put rock guards on the lights. Would look good I think. Very nice job! Lights have very thick, lexan covers, very protected.